2 careful about that sort of thing, you know. Do write again when the spirit moves you - and prod it a little if it doesn't stir before too long. Already it is eight oclock, and it seems as if I finished supper just a few moments ago. Have some navigation theory I must read over, and, also, the course rules for Saufley field where I begin my primary flight training tomorrow, so had better call it quits for this time. Will plan to tell you about the location of this field, how the flights & instruction are handled, and something about my instructor next letter. 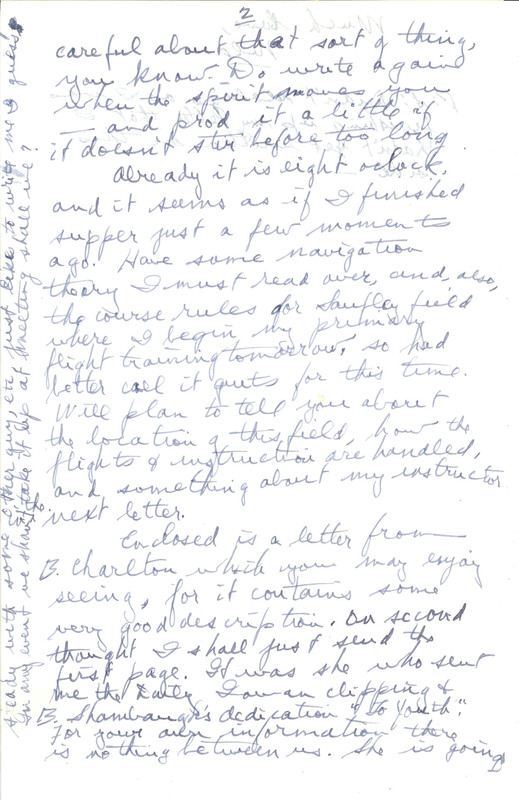 Enclosed is a letter from B. Charlton which you may enjoy seeing, for it contains some very good description. On second thought I shall just send the first page. It was she who sent me the Daily Iowan clipping & B. Shambaugh's dedication "To Youth." For your own information there is nothing between us. She is going steady with some other guy, etc, just likes to write me I guess. In any event we shan't take it up at meeting shall we?